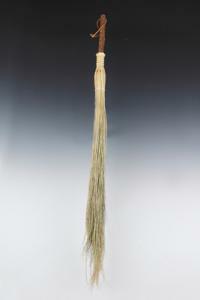 This gorgeous broom is hand crafted by the creative student apprentices at Berea College. It is perfect for the farm house, the garage and basement, as you can sweep those high corners clear of cob webs effortlessly. It also makes a lovely addition to any kitchen's decor, even if house keeping "ain't yer thing". size: 36" x 3" x 3"